Learn how to paint like a professional today! Painting a room is a fun job. It requires a bit of effort, but with the right paint products and preparation, you can paint that that room of yours to perfection! Here are some painting secrets to help you with your project. A person should only paint when the weather is cooperating with them. If there is precipitation of any kind, it is in your best interest to delay your painting project. You also want to avoid humid days because it will lead to drips and a slow drying process. If you can, you want to paint on a dry weather day. If you want your room to look like it was painted by a professional, you need to purchase high-quality rollers and paint brushes. Believe it or not, they actually will make a considerable difference. It is worth spending a few extra dollars on better painting equipment. Preparation is a huge part of the painting process. The more preparation you do, the easier and faster the process will be. Make sure you have the necessary paint products, drop cloths laid out, painting clothes on and maybe friends or family members to help you get the job done. Painting is a messy job. Therefore, drop cloths are your best friend when you are painting. They are extremely inexpensive and serve a huge purpose. Buy plenty of them and place them over furniture, hardwood floors, carpeting, etc. 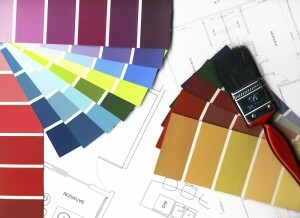 Many people make the mistake of buying too much paint to and paint products, to begin with. More than likely you are buying paint from a local store that isn’t too far away from you. If this is the case, buy small amounts of paint at a time. You can always come back and buy more.